President George W. Bush had hoped to leave office with Israelis and Palestinians having agreed on a two-state peace solution. Instead, he'll leave behind a situation more akin to a three-state standoff primed to explode in a new bout of violence. And the embattled Palestinian leader upon whom the Bush Administration has been depending in its peace efforts looks likely to see his role diminish even further. Palestinian Authority President Mahmoud Abbas, who made a valedictory visit to the White House on Friday, has seen his political authority grow steadily enfeebled since Hamas won the Palestinian legislative elections almost three years ago and then seized military control over Gaza 18 months later. Today, it is with Hamas that Israel has to deal  via Egyptian intermediaries  when it seeks to stop Palestinian rocket fire into its territory. Abbas may enjoy the good offices of a lame-duck U.S. President, but he has been reduced once again to a powerless spectator as Israel and Hamas tussle over whether the tahdiyah truce, declared dead after six months by the militant group last week, will be revived. And there may be worse to come for Abbas. Although Hamas has continued to recognize Abbas as the legitimate President of the Palestinian Authority, that may be about to change. 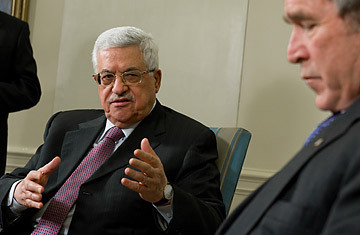 Abbas' presidential term expires on Jan. 9. Although his own Fatah party makes a case that the term could legitimately be extended by another year, Hamas is having none of it. In the second week of 2009, it will no longer recognize Abbas as President, thereby formalizing the political divorce between the two Palestinian entities. Abbas has long since withdrawn recognition of the duly elected Hamas government in the West Bank, which is controlled by his security forces in concert with the Israelis; now Hamas will formalize its de facto denial of Abbas' authority in Gaza. Meanwhile, the dynamic between Israel and Hamas remains one of low-key violence that could erupt into full-blown confrontation at any moment. Hamas last week announced that it would not renew the truce brokered by Egypt last summer, arguing that Israel had failed to restore the normal flow of commercial traffic into Gaza that the movement had been expecting. Israel claims it had reached no such understanding and cites ongoing rocket fire from Gaza into towns in southern Israel, which has dramatically escalated since an Israeli raid on Nov. 5. Diplomatic efforts continue, however, and Hamas on Monday announced a 24-hour truce, at Egypt's request, to allow for further negotiations. Israeli politicians, in the thick of an election campaign, are under pressure to respond forcefully to the ongoing rocket fire from Gaza. But the Israeli military is reluctant to launch a full invasion of Gaza because of the cost in civilian and military casualties, and also because Israel lacks a plausible exit strategy and wants to avoid assuming responsibility for the territory. Hamas also wants to prevent a large-scale Israeli invasion, which would eliminate its capacity to govern even if it remained the premier resistance organization. But while both sides have an interest in containing their low-key war, the problem is that the rockets fired from Gaza are hardly precision-guided. The moment a missile hits a school or a bus, Israel's leaders will be compelled to return a more robust military response. That, of course, may be what President Abbas  and others in the Arab world hostile to Hamas  are counting on as the only plausible scenario for restoring Fatah's control over Gaza. Abbas has threatened to call new presidential and parliamentary elections if Hamas won't recognize him as President after Jan. 9, but that's an empty threat. Hamas controls Gaza, and it rejects holding new parliamentary elections there ahead of schedule. And Abbas is hardly assured of winning a solid mandate even in the West Bank, where the Fatah party retains control but is beset by an image of corruption. Calling an election on the West Bank would risk a turnout so low as to make a mockery of the poll. With such dubious prospects for an election, the most likely scenario for changing the balance of power in Gaza remains Israeli military intervention. "The Palestinian Authority is expecting the Israeli Defense Force to go into Gaza and defeat Hamas and then restore the control of Abu Mazen [Abbas]," an Israeli security official tells TIME. But the Israeli security establishment is skeptical of Abbas' ability to maintain control in Gaza and continues to see risk outweighing reward in an invasion  although that calculation could change very quickly if a rocket fired from Gaza were to inflict mass casualties in Israel. Last week, the U.N. Security Council characterized as "irreversible" the Israeli-Palestinian talks that have been held at the behest of the Bush Administration over the past year. But they have simply been conversations that have resulted in no actual movement forward on the ground. The grim reality confronting all three sides of the Israeli-Palestinian conflict, as well as the Obama Administration, in the new year is that the situation remains deadlocked and that the stalemate will more likely be broken by a new round of violence than by any peace talks.